Gaël Méheust is president and Chief Executive officer of CFM International (CFM), the world’s leading manufacturer of jet engines for single-aisle aircraft. He was named to the position in February 2017. In this position, Mr. Méheust serves as the company’s global representative in its relationships with customers, government agencies, industry associations, and the media. 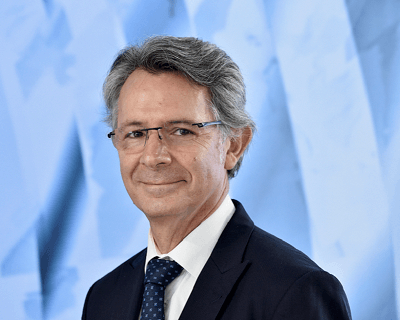 He provides corporate leadership for the integrated management of the joint venture, as well as serve as a key interface between the top management levels at GE and Safran. He also has responsibility for the world-wide brand awareness and reputation of CFM. After achieving a Master’s degree in international business from the University of Rouen, Mr. Méheust joined Hispano-Suiza, which was part of the Snecma* group at the time, in 1984, and was named sales and marketing director for nacelles and thrust reversers two years later. In 1989, he moved to Cincinnati, Ohio, where he served as Snecma’s representative for CFM56 military applications. He was named head of Business Development at Techspace Aero (Safran) in 1992. Mr. Méheust moved to Snecma in 1995 to become part of the commercial engine sales team, with responsibility for key European accounts. Three years later, he was appointed CF6-80** engine program vice president, with sales responsibility for all large turbofan engine programs. In 2001, he was named Snecma’s CFM representative with Airbus in Toulouse, France, followed in 2003 by his appointment as general manager of Airbus Programs at Safran corporate level. From September 2007 until March 2010, Mr. Méheust headed the France and United Kingdom engineering business units for Labinal (Safran). In March 2010, he was named to his most recent post as executive vice president of Sales and Marketing for Safran Aircraft Engines. In this role, he played an integral role in launch of the LEAP engine program which, to date, have garnered approximately 11,600 orders. CFM International is a 50/50 joint company between Safran Aircraft Engines and GE with its headquarters in West Chester, Ohio, U.S.A.